‘When in Rome…’ is precisely the wrong phrase with which to start a blog post about Greece, but the sentiment is appropriate. The Ancient Greeks gave us the Olympics; Greece is the spiritual (and literal) home of the marathon. So, when in Greece (on holiday for a week in the sun) run. One of my favourite things about running is the freedom with which you can explore new surroundings, so a 10km tempo run in the afternoon heat can be a great way to recce the following day’s activities. 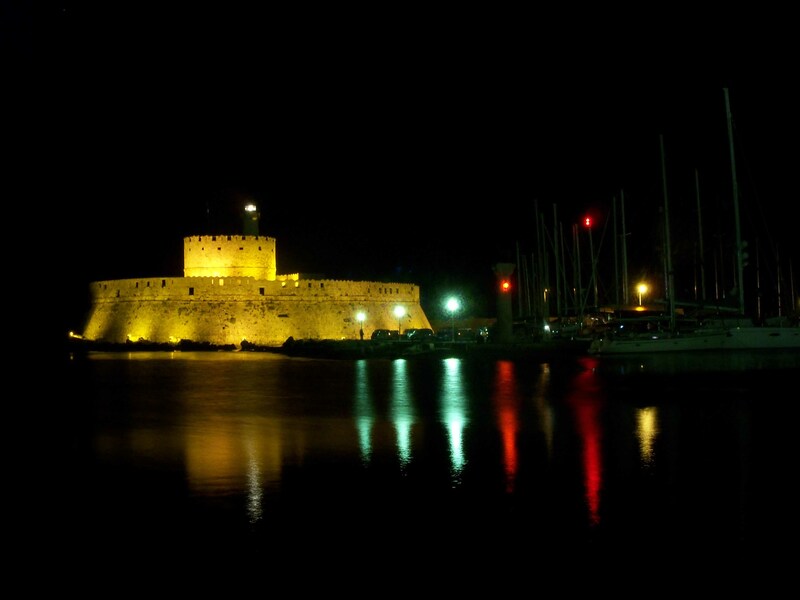 Rhodes was perfectly suited to this since we had booked a hotel in what turned out to be the tourist heart of Rhodes town. With every menu fully illustrated, every bar serving Amstel from 9am and every street rammed with waiters hawking for business (‘You want Greek meal? You like sausage and chips? Come come my friend.’), we’d clearly need to set our sights a bit further afield to get off the tourist trail. The moat, looking very much like a video game. No, really. I don’t want to stereotype, or make sweeping statements, but knowing that the Mediterranean inspires erratic driving at best – particularly along the maze of narrow streets littering Rhodes – I wanted to make as much of my routes off-road as possible. 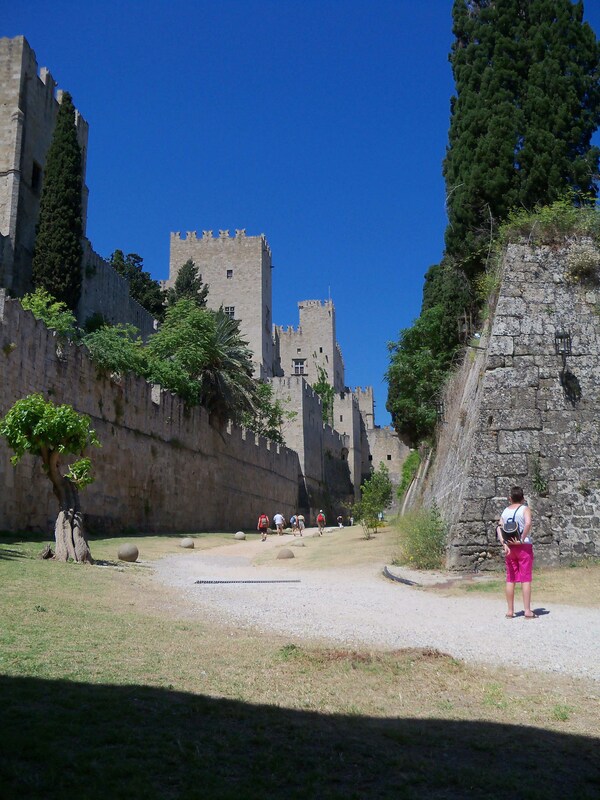 While the mediaeval-walled old town was perhaps the hub of most of the touristy attractions, the Ancient Rhodians had had the good foresight to moat the town. This is now a nice gravel path, lined with palm trees, carefully stacked pyramids of canon balls, and – apologies if this means nothing to you – looks like something out of Assassin’s Creed. Running through this section of the town I was disappointed not to hear ‘What is he doing?’, ‘He must be mad’ or ‘Why would someone do that?’ I then remembered that I’m 30 and thought about politics or something. The weather in Rhodes was – as you might hope for a summer excursion – hot and sunny, although the island’s position in the ocean means that it tends to get the odd ‘fruity’ storm in the early summer and strong winds can quickly whip up. This I deemed good experience in anticipation of summer rolling round in the UK (although, when we stepped off the airplane at Stansted to be greeted by an icy blast and a smattering of rain, that seemed like an optimistic thought). On my final run of the holiday, with my Garmin bleating to protest its drained battery, I set off to find out whether the Acropolis at the top of the hill behind Rhodes was worth visiting. (I should note that the owner of a very nice restaurant we found pointed out that the real Acropolis was actually near Athens and that this was just a smaller copy.) Part-way through the climb up the road, while avoiding a pack of stray dogs, the Garmin’s battery quit. So, unfortunately, the map below looks like I petered out somewhere in the suburbs. The route actually followed on to the ancient stadium at the top of the hill (the sand-coloured lozenge shape at the bottom-left of the map) before cutting down into town. At the risk of just posting the best of my holiday photos, the pictures below give some kind of indication of the sights I passed on my runs. Each is of a landmark I ran past, but photographed at different times when we were exploring the town in a more leisurely manner. 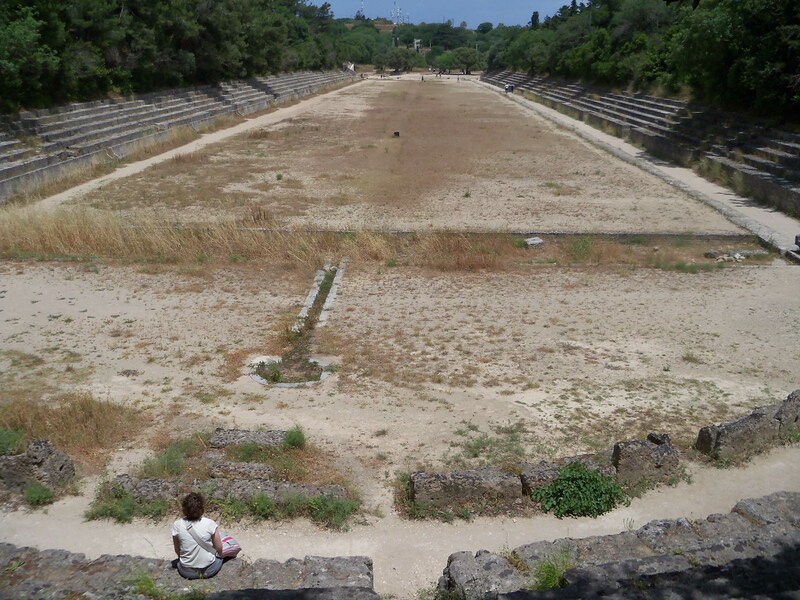 At the top of the hill, the 2nd century BC running track and stadium. Impressive. There are cats everywhere in Rhodes. 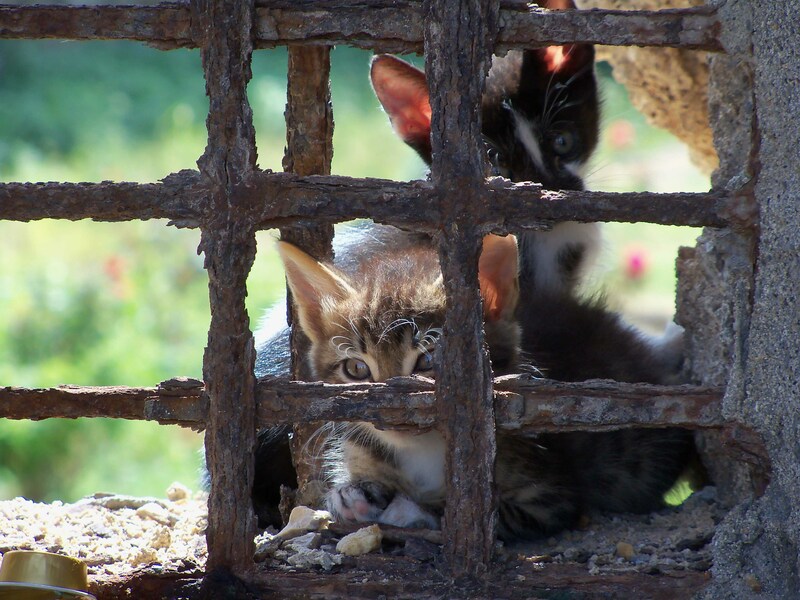 These kittens were hanging out in a part of the medieval walls that I ran through before passing back towards the harbour. Thank you! 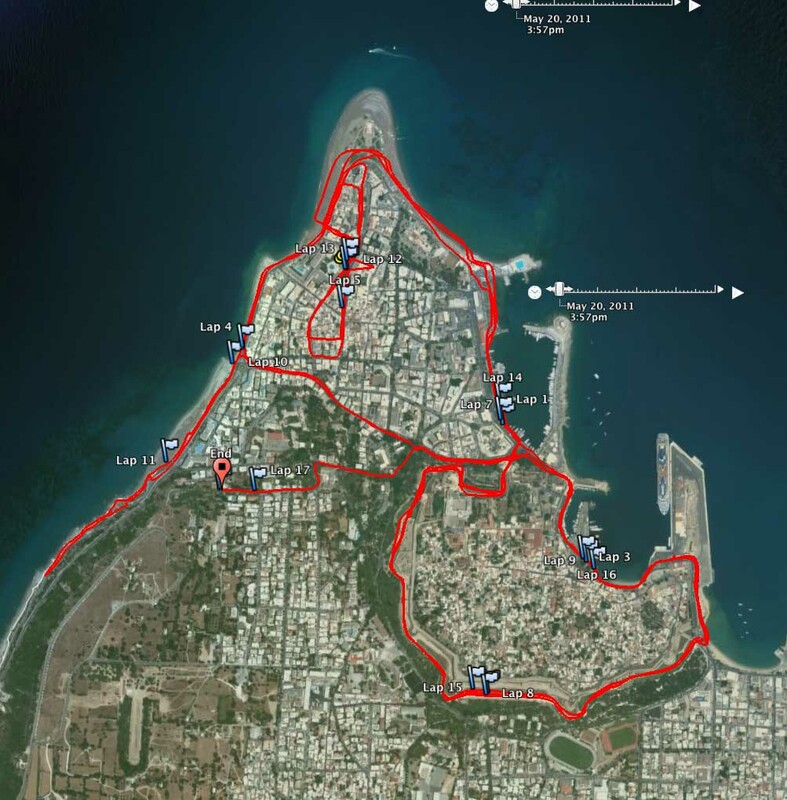 We just went on a cruise to some Greek islands (actually, still in Crete) and I used your Garmin map in Rhodes as our personal running guide. We sort of meshed your 3 runs into one long run (from the harbor, around the coast, up to Acropolis and stadium, back to moat, around the moat, and back to our ship). I wouldn’t have known how to maximize our time without this page. Many thanks! I’m glad the post was helpful! I really like exploring new areas on a run, so a holiday is a great opportunity to cover some interesting new ground. I hope you enjoyed the rest of your cruise! Im heading of to Rhodes next sunday and hope to run som km. down there. It’s there any track and field court for us to run at? Hi – the closest thing I found was the track at the acropolis. There’s a bit of a climb as you head up to it, so you get a good view as you’re doing your repeats!